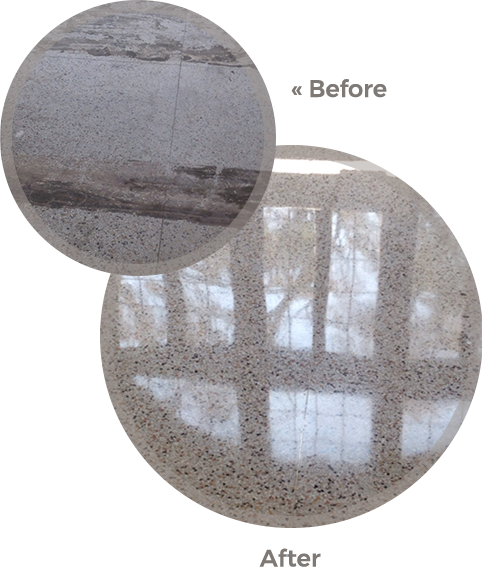 Similar to concrete we use a multi-step diamond-polishing system to grind, hone and polish your Terrazzo and/or Marble floor to a mirror like finish. The floor is then sealed with our Terra-Guard coating to protect from spills and stains. 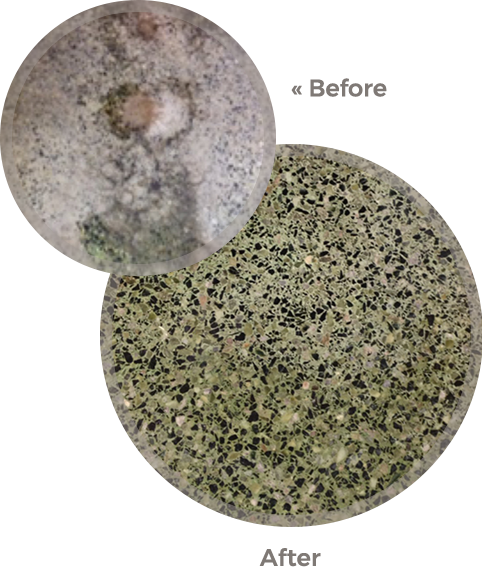 It is also important to perform regular maintenance on your Terrazzo/Marble to keep the appearance looking great and avoid the huge cost associated with future restoration. This new compound is a “glass like film” that creates a barrier between your floor and the things that could harm it. The crystallization process is also a very maintainable type of system. Additionally, significant cost savings can be achieved by reducing frequent stripping and waxing cycles. 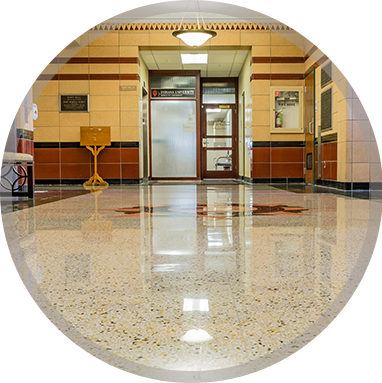 All Terrazzo floors age over time and require maintenance to bring them back to like-new condition. Occasionally Terrazzo floors need a full restoration. This is evident when cracks, pits, and wear patterns occur over a significant portion of the floor. When full restoration is needed, we inspect your floor to develop a comprehensive restoration game plan that fits your needs and budget. Once the comprehensive restoration game plan is developed, our trained technicians begin the restoration process. Initially, we start by prepping the work area and ensuring that all vulnerable areas are protected. Next, we must remove any existing floor coverings or floor coatings prior to grinding the floor. After grinding the floor, we grout the pits, cracks, and holes with a matching epoxy and then grind the floor again. Using progressive diamonds, we hone and polish the floor. Our final step is vitrification, which creates a glass-like film that protects the terrazzo floor and acts as a barrier for protection from spills and normal foot traffic wear and tear. Once our full restoration is completed, you will have a gorgeous restored terrazzo floor that is easy to maintain and will last for many years to come.